TestCafe automatically compiles TypeScript before running tests, so you do not need to compile the TypeScript code. TestCafe bundles the TypeScript declaration file with the npm package, so you do not need to install it separately. 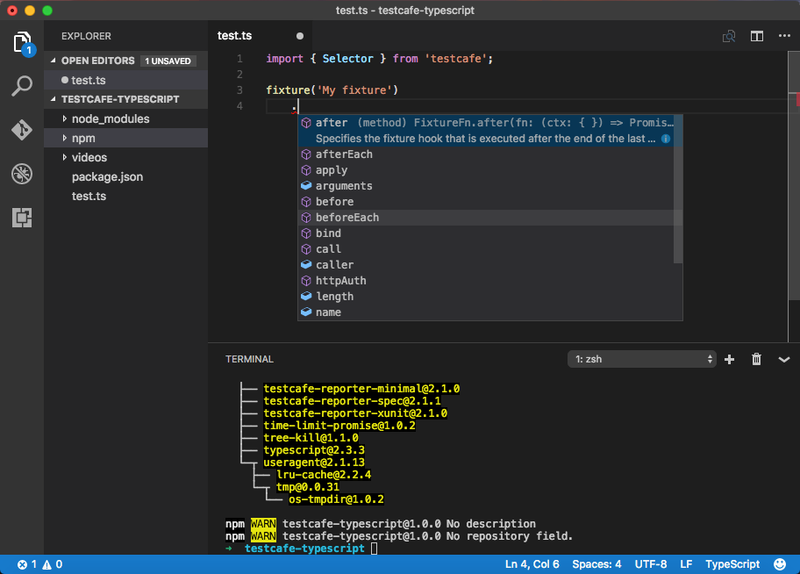 To start writing tests with TypeScript, install TestCafe into your project directory. For more information, see Installing TestCafe. When writing test in TypeScript, it is required to import TestCafe module first. If installed globally, TestCafe will successfully compile and run your tests written in TypeScript. In this case, your IDE will not be able to find the TestCafe declaration file and provide code completion.